I decided to re-publish this particular recipe in preparation for another recipe to come soon! 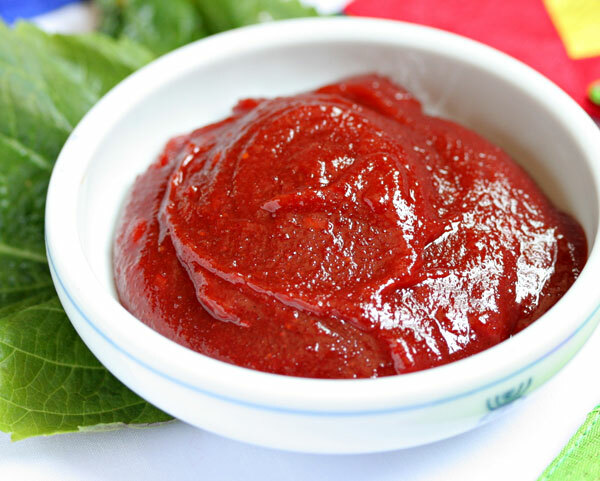 Gochujang is a savory and pungent fermented Korean condiment. Traditionally, it has been naturally fermented over years in large earthen pots outdoors, more often on an elevated stone platform, called jangdokdae (장독대) in the backyard. Not only the Koreans, but the Japanese use it a lot when they make their own-style Korean food! Here is a simple home-made recipe that should help everyone control the ingredients. And it has the merit to be vegan/vegetarian! -Pour water in a large enough pan. Add sugar. Heat until all brown sugar is dissolved. -Add miso. try and use a combination of a few miso pastes. It will add to the taste. Keep heating, stirring with a wooden spatula all the time until mixture is smooth. -Once most of the water has disappeared, add Korean Chili pepper powder. Mix well. Keep heating and slowly stirring untl water has disappeared and big bubbles start bursting at the surface. -Switch off fire. Let cool until about 25~30 degrees Celsius temperature (your own skin temperature!). Add salt, sake/soju and rice vinegar. Stir well. This last step at this temperature will insure that all yeasts are killed and will prevent further fermentation. -Secure inside a vessel and leave inside the fridge. Can be kept for a whole year inside the fridge. Mix some gochujang with red miso, rice vinegar, sugar, soy sauce, Japanese sake or Korean soju and sesame oil. Stir the lot well and pour over a plate of sliced fish such as pike mackerel/saurel! Previous PostRainbow Charity Cocktail Rally 2012 in Shizuoka City March 11th~April 11th!Next PostJapanese Gastronomy: Taberu Rayu/Okinawa Chili Oil. Home-made Recipe! Very nice recipe. My mother used to make a similar short cut gochujang. She let the the gochu-garu (Korean pepper flakes) bloom in ice water to retain the bright red color and mixed it with white miso, mool yut (barley malt syrup). The flavor was really close to homemade and earthenware jar fermented gochujang. Basically, she let someone else do the hard/time consuming part by buying really high quality miso. Oh I am so happy to see this post! I came over because I saw you posting at Sissi’s, and you sounded quite the authority on jap food. This is such a plus, I’ve been wanting to make many things that require gochujang. But the gochujang I find in the asian markets all have lots of shady ingredients in them. This is great, not only do I have all the ingredients already, including the miso and the red pepper flakes. Oh wait. Sake/soju. HMM. Will Chinese shaoxing rice wine work?? I’m glad to have helped! Shaoxing should be fine, but do experiment with the quantities! Robert-Gilles, I am really impressed! You were right to republish it because I haven’t noticed it in old posts. I love gochujang, luckily I can buy it here, but if I could buy Korean chili powder, I would make it on my own (I can buy only the Korean flakes and noway to grind them), but maybe they will arrive to my shops one day! Any chili pepper, whole or in powder is OK! After all this blog is already almost 5 years old! I love Dragonlife, better than Robert. Actually Dragonlife comes from my first blog at http://dragonlife.wordpress.com/ ! As for the chili pepper, whole and dry or in powder form it does not have to be Korean. In Holland and Europe you should be able to acquire them easily as they them in many styles of cuisine! Keep in mind that it far more piquant than paprika!